Matt Slagus is a freshman track and field thrower majoring in sport marketing & media from Moscow, Pennsylvania. Cheyenne Alexis: What do you enjoy about track and field and throwing? Matt Slagus: I feel like some people will look at track and field as a single individual sport, because it’s not like football where you have to play with another player at the same time. I think that track and field is just as much of a team sport as that is, because if your teammate throws well, it builds off of you and you want to throw better because they’re throwing well. I would like it less if it were just purely individual. CA: Do you have any memorable moments as a Coyote athlete so far? MS: Our first meet on Dec. 1 at South Dakota State University was pretty memorable because it was my first collegiate meet so far. I had not the best day in the weight throw, but then I had shot put later on and I threw 54 feet, six inches. With that throw, I’m number six in the Coyote top 10 list of all time (for throws). I thought it was really memorable and it’s cool to be in that top 10 with the top 10 best throwers of all time here in my first meet. CA: Can you explain what you do in your free time? MS: If I’m not studying, then I’m just trying to work on watching film for throwing, because outside of practice you have to put in a lot of work, too. CA: Do you have any set goals for the season? 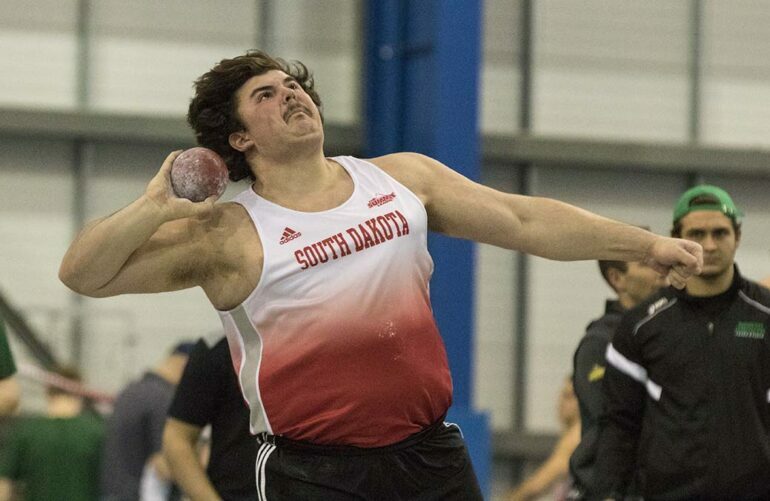 MS: I want to help win our Summit League title indoor and outdoor for the men’s side, and definitely try and make the conference meet to help my team win that. Anything else besides that is a bonus.